Last week we had a cracking set of numbers come through from Alphabet, the holding company of Google, YouTube, Android, Nexus, Pixel and many other smaller businesses. Revenues grew 22% yoy to $24.75bn. Of this, advertising contributed $21.4bn which was up 19% versus this time last year. You would think that coming off such a high base, this would start slowing down but the growth remains solid. This in fact was the biggest beat on advertising estimates in 5 years. For all these online businesses mobile is crucial. Mobile was the biggest driver in ad growth with paid clicks growing by a whopping 53%. This shows the benefit of offering free mobile phone software (Android) which steers all your users towards your own sites. Operating margins remain strong at 38.6%. This all resulted in operating income of $6.6bn for the quarter which equated to $7.62 per share. Earnings for the full year are expected to come in at $34.70 which puts the share on a forward multiple of 26 times. For a company growing above 20% a year, margins north of 38% and a cash pile of more than $70bn (11% of market cap) I think this company is very well valued, if not borderline cheap. Even after the recent rally of 8.6% since these results were released. Since Ruth Porat took over as CFO there has been a lot more visibility and transparency in reporting. Take a look at the image below which categorises Alphabets' businesses. 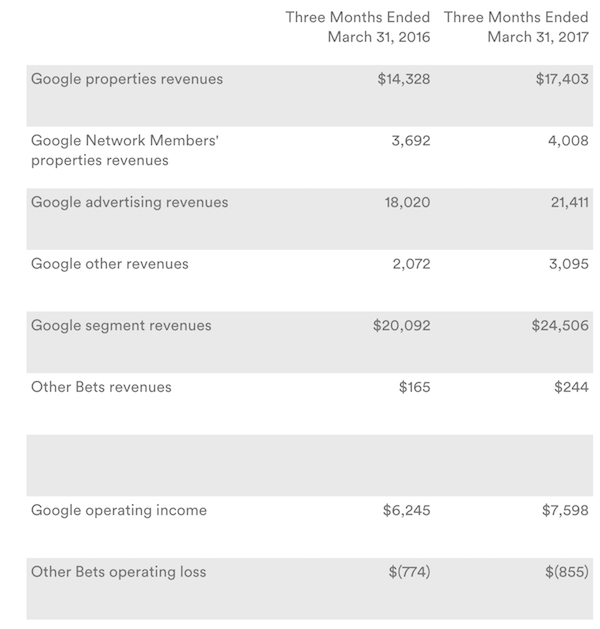 Google Property revenues come from ad results within Google search. This is the big breadwinner of the business and I do not see any slowing down here. People immediately go to Google to look for anything, it is the most incredible advertising tool. Google Network members include ads on Youtube, Google Finance, Gmail and the millions of partner websites that let Google feed ads towards their traffic. Eyes these days are on the screens of phones and computers, Google have almost monopolised adverting in this space and their moat to competition is as wide as it comes. Of course a company like Facebook will be high on the list for online advertising but I think that marketing world is big enough for two dominant players. Quality attracts quality and Alphabet attracts some of the best minds in the world. They also provide an environment that promotes innovation. These new ideas fall within the Other Bets segment. They take it very seriously and provide great capital for big potential ideas. We expect a lot more coming out of Alphabet in the future. But for now their existing businesses tick all our boxes and we are more than happy to continue buying at these attractive levels.